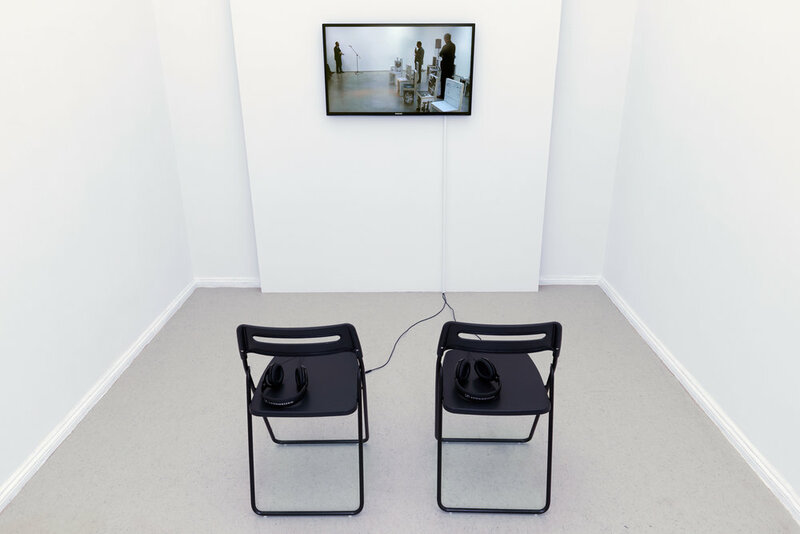 all images: Art & Language, Nobody Spoke, Installation view, KUNSTSAELE Berlin, 2017 / © Courtesy the Artists & Lisson Gallery. Photography: Sebastian Eggler. 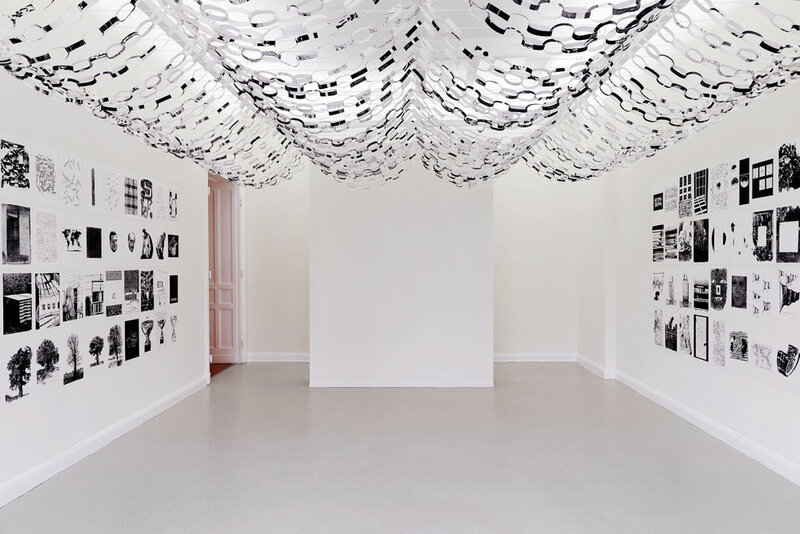 Die Ausstellung „Nobody Spoke“ (09. September – 18. November 2017) der kollaborativen Künstlergruppe Art & Language markiert für die KUNSTSAELE den bisherigen Höhepunkt ihrer schwerpunktmäßigen Auseinandersetzung mit Kunstpraktiken, die sich erkenntnistheoretischen und performativen Aspekten von Kunst widmen. Art & Language, in unterschiedlichen Zusammensetzungen schon seit fast fünf Jahrzehnten aktiv und heute von Michael Baldwin und Mel Ramsden getragen, hat sich von Anfang an skeptisch bestimmten Glorifizierungen widersetzt, von denen die Geschichtsschreibung der konzeptuellen Künste in Westeuropa und in den Vereinigten Staaten so stark gekennzeichnet war und ist. Neben neueren installativen Arbeiten mit Malerei-Objekten, die im Performance-Rahmen des Projekts TheJackson Pollock Bar die Malereidebatten der vergangenen Jahre alt aussehen lassen, wird in der Ausstellung auch ein Fokus auf die Zusammenarbeiten mit dem von Mayo Thompson organisierten Musiker/innen-Kollektiv The Red Krayola gesetzt. Seit ihren Ursprüngen lebt Art & Language mit dem Paradox, als eine „Institution künstlerischer Institutionskritik“ wahrgenommen zu werden. Dabei zählte es bereits zu den ersten Zielsetzungen des Kollektivs, alternative Formen von Kunstproduktion und Kunstvermittlung radikal Institutionen, Genres und Kategorien übergreifend zu praktizieren. Ihre gesamte Geschichte ist von hoher Produktivität gekennzeichnet, aber ebenso auch vom weniger erbitterten als vielmehr oft äußerst humorbegabten Widerstand gegen die ausschließenden Reinheitsgebote mancher Konzeptkünstler, gegen karrieristische Vorstellungen von künstlerischer Praxis, gegen die Werkkonventionen und Warenfetische kapitalistischer Kunstmärkte. Auch heute treten Art & Language zudem vor allem gegen den weitverbreiteten Unwillen an, Sprache, Diskursivität und Performanz nicht nur als werblichen Vermittlungskomplex, sondern als Möglichkeitsbedingung und Austragungsort einer selbstkritischen und selbstreflexiven Kunst zu begreifen, deren Produktion nie zu konsensreifen Sicherheiten gerinnt. In das Zentrum der Ausstellung in den KUNSTSAELEN stellen die Künstler in Kooperation mitThe Jackson Pollock Bar mit „Nobody Spoke“ eine auf verschiedenen Vermittlungsebenen (u.a. auch einer Sprech-Performance mit Publikum) erfahrbare, die Grundlagen der Kunst- und Weltwahrnehmung reflektierende theory installation vor, in der Gemälde zu Sitzmöbeln zusammengefügt sind, während in anderen Arbeiten an der Wandfläche angebrachte Bilder zum Text, zur Textur werden und den zwischen Ausstellungs- und Buchform entstehenden Raum mit historischen und aktuellen Fragestellungen erfüllen, die bei den Betrachter/innen gewohnte Erfahrungsmuster ansprechen und ins Bewusstsein rufen – um sie darauf gleich wieder in Frage zu stellen. Die Kollaborationen mit der vielgestaltigen „Abstract’n’Roll“-Musikgruppe The Red Krayola, deren Ergebnisse in der Ausstellung in einer eigenen Abteilung zu sehen und zu hören sein werden, ermöglichen den Einblick in eine erst kürzlich mit dem Album „Five American Portraits“ wieder intensiver gewordene Begegnung zwischen zwei der für ein Studium lohnendsten Referenzmodelle der jüngeren westlichen Kunstgeschichte. 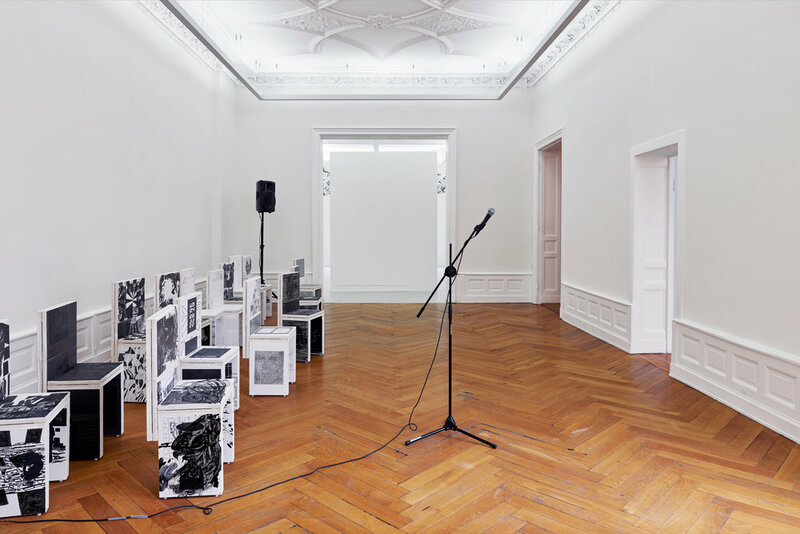 The exhibition “Nobody Spoke” (September 9 – November 18, 2017) by the collaborative artist practice Art & Language marks the culmination of the KUNSTSAELE’s examination of artistic practices dedicated to epistemological and performative aspects of art. From the beginning, Art & Language, which has been active in various configurations for almost five decades and is presently carried by Michael Baldwin and Mel Ramsden, has taken a skeptical stand against certain glorifications that characterize aspects of the historiography of conceptual art in Western Europe and the United States both in the past and today. In addition to new installations with painting-objects, which, within the performance framework of the project called The Jackson Pollock Bar, make the painting debates of the past years look dated, the exhibition also focuses on collaborations with The Red Krayola, the musicians’ collective organized by Mayo Thompson. 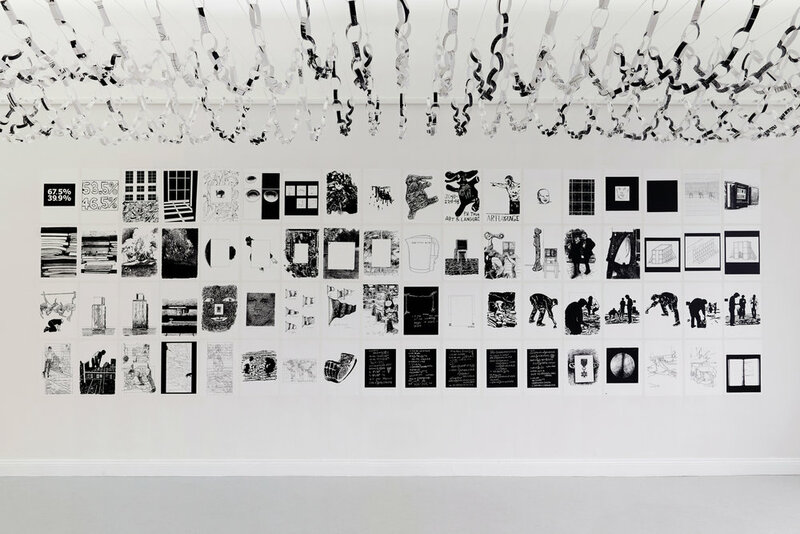 From the outset, Art & Language has lived with the paradox of being perceived as an‘institution of artistic institutional critique.’ It was one of the first objectives of the collective to develop alternative forms of art production and art mediation and to pursue a radical practice across institutions, genres, and categories. Their entire history is marked by a high level of productivity, but also by an exceptionally humorous – rather than embittered – opposition to the exclusive purity of some conceptual artists, resistance to career-oriented concepts of artistic practice, and a refusal to accept the practical conventions and commodity fetishes of a capitalist art market. Even today, Art & Language stands, above all, against a widespread unwillingness to understand language, discursivity, and performance, not only as a complex of commercial mediation, but also as a prerequisite of and as site for a self-critical and self-reflective art, whose production never congeals in the security of consensus. At the center of “Nobody Spoke” at KUNSTSAELE, the artists, in collaboration with The Jackson Pollock Bar present a theory installation, experienced on different levels of mediation (including, among others, a speech-performance with an audience), that is a reflection on the foundations of art and world perception. 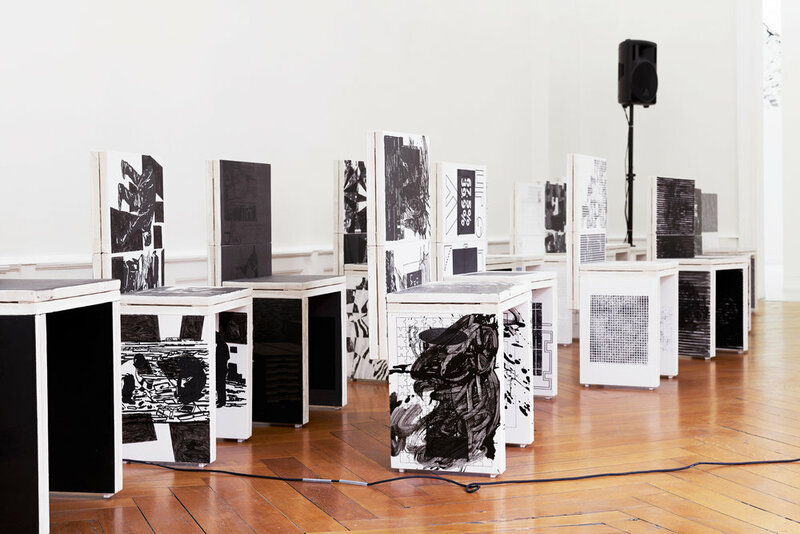 Here, the paintings are assembled into furniture, while in other works on the walls the images appropriate text, becoming texture, filling spaces that arise between the exhibition and book formats with historical and contemporary questions appealing to the viewers’ habitual patterns of experience, calling them into consciousness – placing them once again in question. The collaborations with the multifaceted “Abstract’n’Roll” music group The Red Krayola, can be seen and heard in a special section of the exhibition, allowing insight into the recently – as a result of their collaboration on the album “Five American Portraits” – re-intensified encounter between two of the most rewarding reference models in contemporary Western art history.